Your 4×4’s reliability is unparalleled and keeping it reliable takes routine maintenance. The easiest way to keep yours running smoothly is to keep up with oil changes. Preventative maintenance is critical and considering the low cost for upkeep, it’s the best way to reduce the risk of engine trouble for the lifetime of your 4×4. 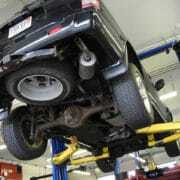 Oil changes are the most impactful routine service when considering how essential oil is to the daily use of your 4×4. They keep the need for major fixes in check if kept to a regular schedule. Dropping your 4×4 off for an oil change is fast and easy, but have you ever wondered just what goes on beneath the hood? If so, take a look at these reasons below. Here are just a few reasons why preventative maintenance keeps your 4×4 on the road. Skipping out on oil maintenance could stop your 4×4 dead in its tracks and that ruins all the fun of owning an off road, extreme 4×4! Oil Filter Clogs – A replacement filter is a part of any routine oil change and yours will be installed by one of our expert technicians. A new filter helps with the proper distribution of oil throughout your 4×4′s engine. Not only does it allow clean oil to pass, but most importantly, the filter keeps build up and sludge out of the engine. Old filters exposed to degraded oil become clogged and useless and this damages internal parts, leading to eventual engine failure. Oil Stress – Because oil breaks down over time (a fact that your average 4×4 owner may not consider when out on an adventure) it’s important to keep the oil in your 4×4’s engine fresh. The temperature and stress put on your engine requires the lubricant to be fresh to be effective, but if oil is not changed during the designated time, its quality degrades until the oil no longer acts as a lubricant at all. Actually, the opposite occurs, as clogs and gunk bring your engine to a grinding halt. This form of engine failure is incredibly expensive to repair when considering how cost effective regular oil changes are. Corrosion – When old oil is circulated throughout the engine over and over again, it spreads corrosion from dirt, dust, and often even water accumulation over an extended period of time. These outside elements break down parts of the engine after repeat abuse. This will also result in engine failure. Cracks & Leaks – Old and degraded oil can cause cracks and leaks within the engine due to debris carried through during use. Additional damage may cause other coolants or even gasoline to leak into the oil. This mixture is toxic to a working engine and will eventually shorten the life of your 4×4. It will damage parts of the 4×4′s engine that are expensive to replace. Advanced Four Wheel Drive & Auto Repair not only provides your 4×4 with the top quality oil it requires during service. We also perform a complete diagnostic to ensure that your 4x4s engine is top notch. Peace of mind is key when it comes to your 4×4. Changing your oil every 3,000 miles or three months is recommended. Drop in or call today to set up an appointment for that oil change you’ve been putting off and keep your engine running at its best.